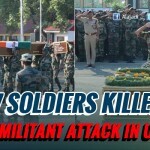 » How India avenged the Uri attack? 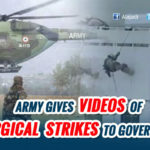 In response to the recent Uri attack that killed 18 soldiers, the Indian Army on Wednesday night conducted surgical strikes across the Line of Control (LoC) on terror launch pads. Indian Army conducted surgical strikes on terror launch pads on the LoC. Heavy damages have been caused to terrorists and many of them have been killed. The motive of this operation was to hit out at the terrorists who were planning to infiltrate into our territory. Prime Minister Narendra Modi on Thursday also chaired a cabinet committee meeting on security on the situation along Line on Control. The meeting took place after Pakistani troops violated the ceasefire twice along the LoC in last 24 hours. The Pakistani Army has also admitted that two of its soldiers were killed in an exchange of fire with Indian forces across the LoC in Poonch district of Jammu and Kashmir today. Earlier today, India responded to unprovoked ceasefire violation by Pakistan on LOC with punitive strikes. Two Pakistani soldiers have been killed in Indian firing. All party meeting at Home Ministry to begin shortly, security enhanced in the area. All schools within 10 kms of India-Pak border to be closed till further orders, says District Education Officer, Ferozepur(Punjab). Congress President Sonia Gandhi says “we stand with the Govt in its actions to protect country’s security”. Party hopes Pak will recognise that it bears a great responsibility in continuing cross-border terrorist attacks against India. High level meeting of top civil, military officers in Uri to discuss evacuation plans in case Pakistan ends ceasefire, resorts to shelling. BSF cancels beating retreat ceremony at Wagah border for today. Villages in Punjab which are 10KM from International Border with Pakistan are being evacuated, additional BSF troops move in. The location was 500 meters-2 Km across LoC. 7 terror launch pads were destroyed during the surgical strike.